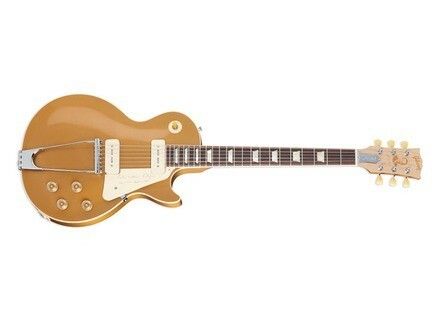 Les Paul Tribute - Bullion Gold, LP-Shaped Guitar from Gibson in the Les Paul series. 2013 is The Year of Les Paul at Gibson, and the brand honors the man with a limited edition Les Paul Tribute guitar. The Gibson Les Paul Tribute is a recreation of the Les Paul model in its first year of production, with a bridge adapted to the specifications of Les Paul’s own patented 1952 design, plus an all-gold finish on top, back, and neck. Commemorative details include a maple headstock veneer with laser-etched logo and Les Paul portrait, a steel truss-rod cover etched with “Les Paul,” a vintage cream pickguard hot-stamped with Les’s real signature, “Lester William Polsfuss” and the years of his lifespan, plus a call-in pack that includes a Les Paul book, varsity jacket, and Gibson “Factory Craftsman” T-shirt. Only 400 guitars will be produced. More details available at www.gibson.com. DiMarzio ships the Ionizer 8 Tosin Abasi pickups DiMarzio announced the launching of the Ionizer 8 Tosin Abasi Signature pickups for 8-string guitars. Dunlop introduces the Fuzz Face Mini Dunlop shrinks its Fuzz Face pedals with the Mini Series, which includes three models designed to fit in a standard pedalboard. MusicMan launches the Armada guitar MusicMan adds to its 2013 catalog a new electric guitar named Armada, available in seven two-colored finishes.